I didn't know about summer breakfasts and winter breakfasts till today.. But I usually eat some cheese sandwiches.. If I were given a choice, I would have doughnuts every morning. Different flavours everyday, all mini sized ones. This is for winter. I didn't find muesli that tempting you know. Does it taste better with curd? You have a varied mix of favorites there, Elly! I like the sound of all those things. You must share pictures sometime on your own blog. Princess, I'm still to try oats with milk. I've only had it salty so far, with vegetables, in the form of poha. Do you use instant oats or do you first cook them somehow? My summer breakfast is oats with curds, sprinkled with black raisins and dates. My winter breakfast consists of mostly my fav Italian omelette with toasted bread and hot coffee. Oh, and I also love having chilled coffee during summers. And, reading your post has now made me hungry!!! And, it's time to sleep!!! :D I am sure going to dream about that sandwich and coffee tonight! Cornflakes with coffee in it? Now that's something I've never heard of or tried. It might make my coffee too sweet though so I doubt I'll be trying it any time soon. 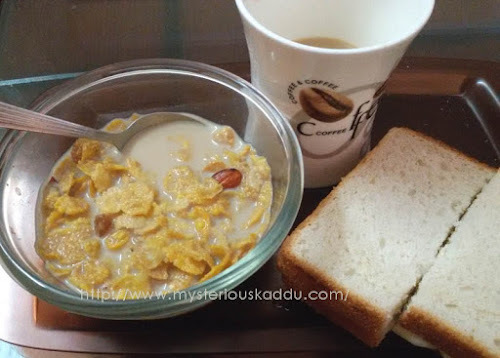 I love having cornflakes for breakfast but that with cold coffee is something I have never tried! @Shilpa Gupte - That must be salty oats, right? And that Italian omelette and totat sounds cool. How do you make it? Sanch, I don't like it too sweet either. I take very little sugar in my tea/coffee... like about one-third tea spoon. I just make cold coffee my normal way and then add it to a bowl of cornflakes. No extra sugar. I add a few raisins and they provide the extra sweetness. Well give it a try, Pooja. If you like cold coffee, you should like it.